Like Dustin Hoffman in his film Quartet (2012), I drew inspiration from the extraordinary documentary film made by Daniel Schmid in 1984, Il Bacio di Tosca, about a retirement home for opera singers in Milan, founded by Guiseppe Verdi in 1896. THE DRESSING ROOM is adapted from an earlier chamber opera of mine, Arias for Phonograph and Singers (1990) for mezzo-­‐soprano, tenor and baritone, produced by Chamber Made Opera, Melbourne in 1993. Arias was selected by World Music Days, Copenhagen, in 1996, and received its Swiss première in Zurich, 1997, forming a double-­‐bill with John Cage’s Arias. This Festival presentation of THE DRESSING ROOM is a version for solo performer that by no means replaces the former work, both being fully scored and published. Nor is it my intention to remain the sole performer of a chamber opera that exists independently of its (re-­‐)creator. The scenario takes place in a backstage dressing room of a latenineteenth-­‐century/early twentieth-­‐century opera house, where a singer prepares for her role in Gaetano Donizetti’s La Favorita (1840). 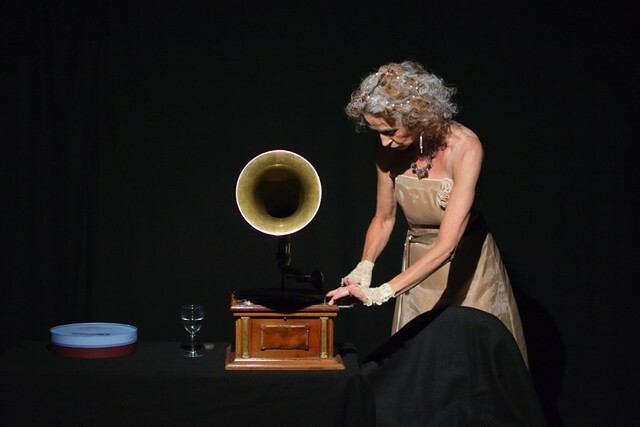 She reflects on her curious existence in this fictional world — the historical recreation of which is highlighted by the presence of a gramophone — and enters into a dialogue with the ‘ghost’ of her contemporary counterpart on shellac disc. Exploring her own memory as a performer, she re-­‐embodies dramatic moments from past operatic roles and interacts with a machine that cannot only record, but also play back the voice. The piece explores the inner dialogue of that most famous of operatic forms, the aria, together with the physical presence of a singer onstage. The scenes are: The Gramophone Aria, The Warm-­‐up Aria, The Mirror Aria, The Telephone Aria, The Recording Aria and finally The Dressing Aria. Caroline Wilkins (composer/performer) comes from a background of new music-­‐theatre and has worked extensively on solo and collaborative productions. Performances include Zaum: Beyond Mind and Victory over the Sun at Tête-­‐à-­‐Tête: The Opera Festival 2013 and 2014. She is currently finishing a three act chamber opera entitled Beyonsense. Oh Whistle & I’ll Come!